The proposed extension of the public bus service between Camperdown and Timboon, to include Port Campbell, has received overwhelming support in a community survey. More than 95 per cent of 70 respondents have supported the plan. Popes Timboon, which operates the service for Public Transport Victoria (PTV), flagged the extension last year. The plan has since received support from the Corangamite Shire, Advance Camperdown, Timboon Action, the Port Campbell Progress Group, Twelve Apostles Tourism and Business Association, Progressing Cobden and the Camperdown-Timboon Rail Trail Management Committee. Popes Timboon operations manager David Pope said the survey results would be used to demonstrate consultation and community support as part of ongoing talks with PTV. “There are also lots of verbatim comments in the survey results that will add further weight to our negotiations,” he said. “Many people can see enormous benefit in connecting Port Cambell with the V/Line train service in Camperdown – both from a community and tourism perspective. Mr Pope said the survey was designed to gather feedback on a number of other proposed changes to the public transport service, which operates 28 times every week. “I’m really passionate about the health benefits that can be achieved for our communities when public transport opens up more recreational opportunities,” he said. “It was great to see that 65 per cent of people would like us to add racks or a trailer to the bus so that they can board with their bikes, surfboards, golf clubs, fishing gear and other large items. The public bus service is currently timetabled to work in with the V/Line train timetable at Camperdown on Thursdays, Fridays, Saturdays and Sundays. Mr Pope said the majority of survey respondents who provided feedback on the current timetable wanted the same connectivity with the V/Line train on Mondays, Tuesdays and Wednesdays as well. “We certainly have the capacity to operate seven days a week and we are always talking to PTV about that, so the community support is very much appreciated,” he said. “An extension of the timetable feedback was the strong support for additional stops to be included along the route – particularly for people to access health services. Mr Pope thanked the community for taking the time to help shape the future of public transport in Corangamite Shire. He announced that Melissa Berry of Timboon was drawn out as the lucky winner of lunch for four people at The Fat Cow in Timboon. 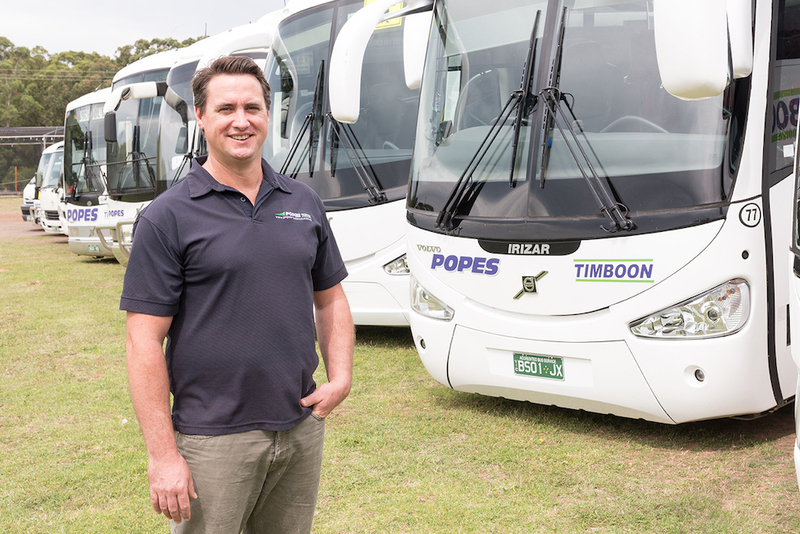 Popes Consolidated Bus Lines Pty Ltd.
Timboon Scotts Creek Road, Timboon, Victoria, Australia.